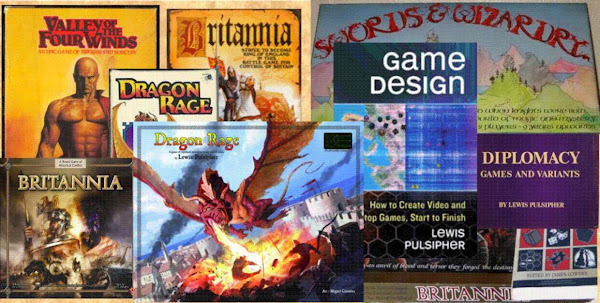 I asked a few people at PrezCon 2006 what kind of pieces they preferred in games (someday I'll make a Surveymonkey survey out of this). One player pointed out that 3D pieces such as figures are best when you want to move them around (as in Chess), but flat(ter) pieces are OK if you just place them and leave them there (as in Tigris and Euphrat and many other tile-laying games, or as in Go). I sometimes use one inch square colored hard plastic-foam pieces, about a quarter inch thick, in prototypes. I've not seen such pieces used in a published game. 3D pieces are more prone to being knocked and jostled around than flat pieces. I have used figures to playtest Brit Lite, but I think I'll try using the counters from B2 the next time I play it solo, as they won't be as "fiddly". On the other hand, I have always used figures in Germania, Seas of Gold, and other "Euro-wargames", and always will, because part of the attraction is the visuals. Further, there are relatively few pieces in these games, compared to some of the larger Brit-like games. Some people want their 3D pieces to look like real objects, hence the figures that look like soldiers or horsemen or tanks or cannon (Axis and Allies). Some seem to be as content with wooden or plastic blocks or cylinders, or glass beads, or stylized wooden pieces. I don't think colored plastic chips quite count as 3D, though they are not cardboard counters. At least one of my games, Law & Chaos (TM), originated as an attempt to design a game using glass beads (which I quite like, but which are not practical in large numbers because they drive up the shipping weight of a game). I've also seen other suggestions that those first four colors are ideal for four player games. FFG used them in Britannia, perhaps explaining why they chose to have yellow pieces instead of purple on what is basically a yellow map. Of course, Gibsons (and AH) had green pieces on a green map . . .
Is there a "sweet spot" or "magic number" of spaces for an area-based boardgame (or any other kind, for that matter) where pieces occupy areas? Chess and checkers have 64 spaces and (respectively) 32 and 24 pieces. My Law & Chaos (TM, prototype) has 61 areas, with a varying number of pieces on the board (tending to grow larger over time). Tic-Tac-Oh (prototype) has three boards of 16 squares each (48 areas). Go, on the other hand, has far more "spaces" (the intersections of areas on a 19 by 19 grid). Intuitively, you might expect that fewer areas means the game is simpler to deal with, though the game may still have a great deal of depth. How about "classic" area-based wargames? Risk has 42 areas. Britannia has 37. Vinci has 45 (by quick count). Diplomacy has (by quick count) about 65 areas for 34 pieces. History of the World and Axis and Allies have many more areas (and original A&A had a lot more, IIRC). Perhaps there's a relationship between number of pieces on the board and number of areas, but I don't have the data to compare. In chess there's one piece for each two areas. The average for Britannia depends on the era, but is roughly 55 pieces for the 37 areas. The ratio in Vinci is something over one piece per area. In Risk it's a lot higher, at times. Diplomacy's ratio is much like that of chess, about two areas per piece. I'm not sure where this rumination has arrived at, but there it is.